Really, among the open games the only opening with which White can really fight for an advantage in the long term is the Ruy Lopez. But in order to make this serious effort, he has buckle down and learn a whole series of sub-variations. That is what the professionals do, including of course Viktor Bologan, who now reveals the secrets of his own grandmaster repertoire. 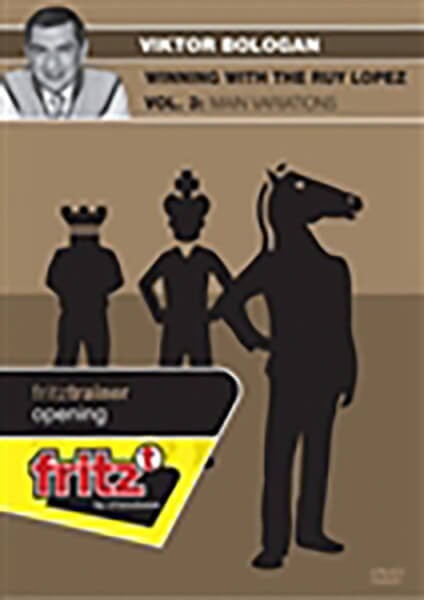 For many the Ruy Lopez really only begins after the moves 3...a6 4.Ba4 Nf6 5.0-0 Be7 6.Re1 b5 7.Bb3 d6 8.h3 0-0 9.c3 - the starting point for Bologan's third DVD. Black then has a whole host of variations, but the ensuing structures have much in common and if you are equipped with some insider tips you will be able to take the correct decisions which can frequently only be made on a basis of generalised evaluations. Viktor Bologan is an outstanding adviser because when one considers his super score against the Ruy Lopez, he must have excellent knowledge of the ins and outs of this opening, and he does not hold back from sharing this knowledge with you.